Blurb Description: Paloma High School is ordinary by anyone’s standards. It’s got the same cliques, the same prejudices, the same suspect cafeteria food. And like every high school, every student has something to hide—whether it’s Kat, the thespian who conceals her trust issues onstage; or Valentine, the neurotic genius who’s planted the seed of a school scandal. AND THE WINNER IS: VIVEK NARESH! (I'm sorry I removed the Rafflecopter, it was acting up, and not displaying the winner, so I just removed the code instead) THANKS SO MUCH FOR ENTERING! I'm having my Blogaversary next month and I hope I'll see you all there! How to do this without spoiling said books! Hmm. Third-most romantic: a scene in Leigh Bardugo's SIX OF CROWS, where one exceedingly talented criminal nearly gets murdered, and the other exceedingly talented criminal goes all panicked and soft, despite A Carefully Maintained Emotionless Facade. Second-most romantic: the scene in Tess Sharpe's FAR FROM YOU, where the main character, Sophie, gets intimate with the love of her life for the first time. Reading that scene felt like walking into a tornado. I had to kind of put the book down and breathe and cry for a second afterward? First is going to be the end of the Chaos Walking trilogy by Patrick Ness. The third book, MONSTERS OF MEN, has the most heart-rending end to a series I've ever read (and that's including the romantic/traumatic end to Philip Pullman's HIS DARK MATERIALS series). I cannot say more except to say that every person on the planet should read these books. They're not for everyone, but the people who love them (hi) are always trying to convert the rest of the world to our head-over-heels obsession. 5) (girlfriend) Manon from the THRONE OF GLASS series, badass witch and wyvern-rider. Her character arc is causing me to die a slow, painful death. She's so dynamic, just punch me in the face. 4) (girlfriend) Ringer from THE FIFTH WAVE series. I absolutely adore what Yancey did with her in INFINITE SEA — the depths she's concealing, the choices she has to make ... I just want to hug her and tell her it's going to be okay, although knowing Rick Yancey's plots, that is probably a lie. 3) Kaz Brekker, from SIX OF CROWS. I'm such a SUCKER for emotionally unavailable, sassy, hyper-competent boys. 2) (girlfriend) Lisbeth Salander, the Girl with the Dragon Tattoo. What can be said about Salander besides that she's a feminist avenging angel computer hacker with an eidetic memory and a thirst for justice? I think what we're getting here is that I'm really into girls who could totally demolish me in a fight. 1) Harry Potter. Harry is usually given the short end of the stick when discussing HP characters, because the supporting cast shines so brightly. But Harry is kind, and brave, and unconditionally loving, despite having his family and world torn away from him and having grown up in awful circumstances. I love Harry, and I get really emotional about the whole world having experienced his story together. WHY DO YOU DO THIS TO MY HEART? ... Throne of Glass. It has Manon. And fantasy is my truest love, so it has a genre edge. I've been getting this question recently: "How many books have you sold?" Maybe this is just me and I'm woefully uninformed, but I do not know! I don't think many authors know, either. There's some sort of mysterious algorithm, I think? In my mind it feels a lot like a lottery number. Just some vague concept that there's an infinitesimal chance of getting correct. 5. What was it like writing in seven different points of view? So fun. I'm kind of impatient, and am often juggling three or four projects at any given time, so working in 7 perspectives gave me the same feeling of working on multiple projects without actually doing so. Well, the idea of seven narrators for the seven sins sprang to my head out of nowhere. But my interest in the secrets that everyone's hiding, which is the actual crux of the novel—that came from the internet. I started blogging in, I think, junior year of high school, on Tumblr. The culture of that site is very much overshare. You bare the grisly details, and nobody judges you for being mentally ill, or queer, or a PoC, or—etc., etc. I started wondering about the people in my classes: what are you like when you strip away the exterior? And you? What are you dealing with, what are you battling, what are you hiding? Started drafting in my senior year, and the rest is history. Although funnily enough, the first draft started out as, like, a murder-mystery thriller. I stalled about halfway through and realized that it wasn't working, and also that David Fincher's masterpiece film Se7en exists, and does not leave much room for other murder-filled narratives about the seven deadly sins. Juniper: you don't have to lock yourself away from the people who love you. Your struggles will not be a burden to them. Kat: it's okay to move on. Matt: the Venn diagram of things that exact meaningful change and things that are easy has a vanishingly small overlap. Valentine: defense mechanisms are not a theoretical concept for dissection. Lucas: quantity is not quality. One genuine connection is worth a thousand meaningless conversations. Claire: you could be a perfect copy of someone else, and it would be so much worse than a flawed-but-genuine version of yourself. The world does not need another clone. Thanks so much for having me, Aditi! THANKS SO MUCH FOR BEING HERE, RILEY! It has been an ABSOLUTE Delight! Lust. Envy. Greed. Sloth. Gluttony. Wrath. Pride. Juniper. Claire. Lucas. Valentine. Matt. Olivia. Kat. Seven High School Students. 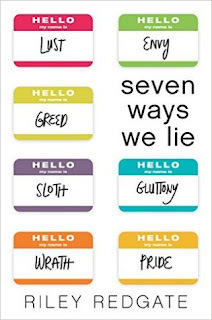 Seven Deadly Sins, all put together in this game we call life. CAN YOU ASK FOR ANYTHING BETTER? ... And then, all of a sudden, it all changed. Something inside me clicked (for lack of better words) and instead of reading at a family reunion, I was there, at that high school feeling Lucas’s fear, and Olivia’s loneliness and Claire’s insecurities. I was there as the secrets unfurled, and the strangest of people became the strangest of friends. As they let out these small details about each other, I felt like I was getting to know seven people in the most intimate way possible. As their facades and the people that high school made them peeled away, I had the time of my life getting to know seven people that I’ve never met before. And, Riley Redgate, for the masterpiece you’ve created, I salute you! Dear Riley Redgate, these people that you’ve created on paper, they have stolen my heart. I’m dying for more. It’s this terrible feeling, where I know I’ve reached the end, but I’ve felt so at home somewhere, it feels like a crime to leave. 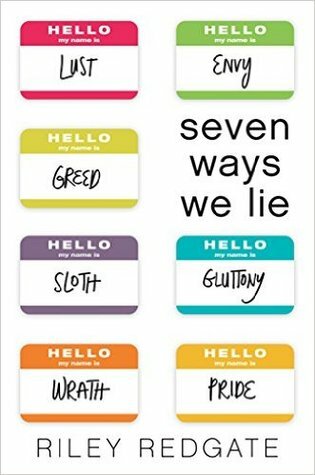 But I guess I just want to say thank you, for giving me (and all your other readers) Seven Ways We Lie. Dear Review Readers, I give you my blessing – go and get this book. NOW. And I mean, NOW. Who cares about this one silly review, and why are you wasting your time reading this? “Crushes ruin lives and destroy souls. Crushes either lead to the inconvenience of unrequited feelings of the batshit-insane idea of having a relationship. Love the top 5 boyfriends/girlfriends!